1. Peel and clean the shrimp, then set in a bowl. Add the blacken and mix well. 2. Boil the water for the pasta, using 4 quarts water per 1 pound pasta. When the water is boiling, add about 1 tablespoon of oil (the oil will limit some of the foaming), 2 tablespoons Kosher Salt, and add the pasta. 3. While the pasta is cooking Grate the garlic, and place in a small pan with 1/4 cup olive oil. Cook on low heat until the garlic is soft, and fragrant. By doing this, you're infusing the oil with the garlic flavor, and cooking out the sharp bite of the garlic. Cook about 5 minutes, then turn off the heat and leave it alone..
4. 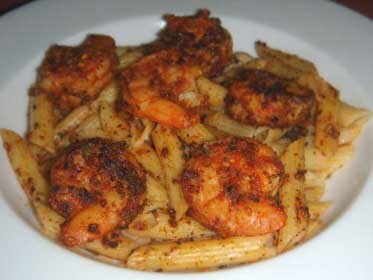 When the pasta is about 1/2 done, start cooking the shrimp. Melt 2 tablespoons butter along with 2 tablespoons of olive oil in a large fry pan. Cook the shrimp, about 1/2 at a time, in a single layer, over high heat, just until the begin to turn pink, about 2 minutes on the first side, and 1 minutes on the second side. Place the first batch in a bowl large enough to hold all of the finished product. Cook the rest of the shrimp the same way, adding more butter and oil as needed. 5. When the pasta is done, drain it and place it in the bowl, add the garlic and oil, and mix up well. Dump the last batch of shrimp into the bowl along with the pan drippings and mix well. If the pasta doesn't seem "wet" enough, you could add a little more olive oil at this time. 6. Plate it and serve with a simple salad, and a light, oil and vinegar dressing.